On May 2, 2013 the Ontario government of Canada released the proposed 2013 budget to be debated at Queen’s Park over the next couple of weeks. The provincial government has reported that the Ontario Child Benefit provides financial support that has helped lift 40,000 children out of poverty. The Ontario government’s 2013 budget marks modest steps toward poverty reduction. For the past three years, ISARC along with other anti-poverty activists have been advocating for stronger moral and ethical values to be reflected in the policy decisions that affect people living on low-incomes. The current budget moves slowly in that direction, while much more remains to be done. The budget focuses on the measures to stimulate the economy and to create employment opportunities in a precarious global economy with “fairness” and “prosperity”. This includes modest changes to the current earning exemption policy, allowing social assistance recipients to keep more of their earnings each month before their benefits are reduced; increases the Ontario Works Asset Limits and simplifies Asset Rules. The Government finally acknowledged the severe conditions of hardship in which single adults on social assistance are living but provides only a 1% increase in the rates. Although ISARC and other poverty advocates have consistently requested a $100 top-up to the basic rate, the Ontario budget only adds a meager $14 top-up for single adults without children on Ontario Works. The budget is disappointing in other ways. The government refuses to honour a previous commitment to raise the Ontario Child Benefit to $1,310 per child by July 2013. Instead they raise the benefit by $100 this year and to the $1,310 level in 2014. The working poor are also left behind. Ontario has frozen its minimum wage at $10.25 since 2010. To our great disappointment, the budget does not include an increase to the minimum wage. Instead, it calls for a review of this issue by an Advisory Panel. Most crucially, despite a critical shortage of affordable housing in Ontario, with 156,000 households on waiting lists for affordable housing, the budget offers no funds nor plans for new affordable housing, except for First Nations communities. This is especially a missed opportunity as any federal budget to include provincial transfers for affordable housing programs would be easier to secure if funds have already been committed in a provincial budget. 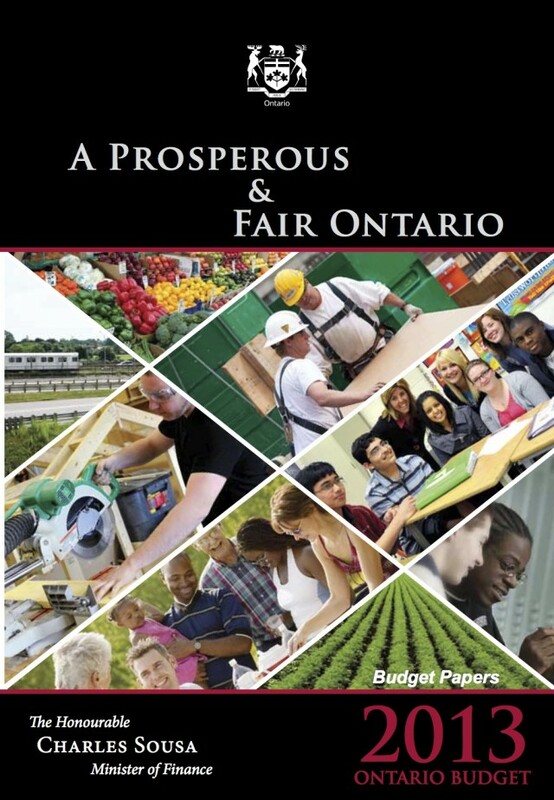 Despite the general tone and concessions toward a “fair” and “prosperous” budget, the Ontario government has a long way to go toward reflecting these values in our society, and most importantly, in the lives of Ontario citizens impacted by the hardship of low incomes. We urge the Members of Ontario’s Provincial Parliament, of all parties, to continue to advance the priorities of a socially just and equitable society and in particular to push for a renewed Poverty Reduction Strategy for our province.